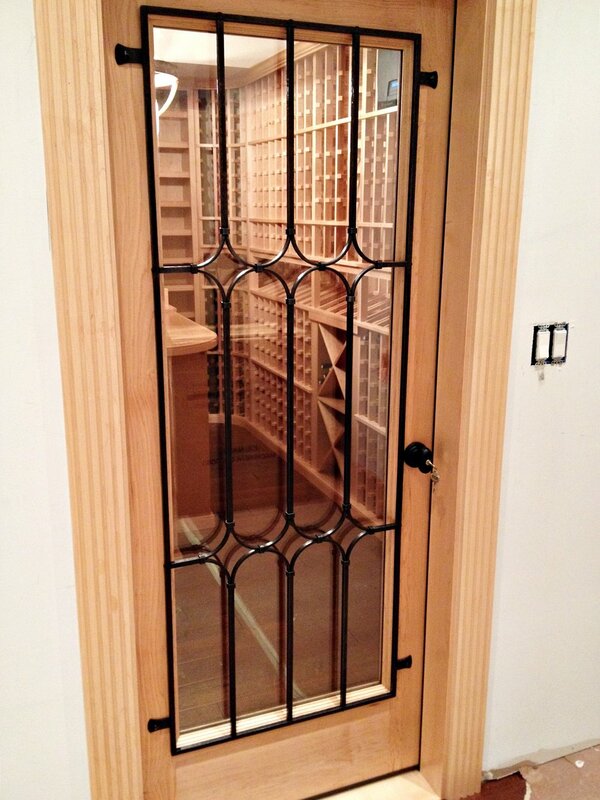 Last fall Kyle was commissioned to create a window grill for a wine cellar door in Washington, D.C. Here are a few process photos and the installed window grill. On left, the final sketch in the foreground while laying out the parts for assembly. On the right, the completed window grill waxed and ready to be installed. And here it is installed in the wine cellar door! Detail photos below. Early last fall we were commissioned to create a forged window grill for the front door of a house in the Fan, a historic district here in our home base of Richmond, VA. This piece incorporated a lot of traditional forging techniques. The framing had traditional mortis and tenon joints. The tenon was forged on the end of the bar using a top-and-bottom die on the anvil. Next Kyle used a monkey tool to clean up the shoulder of the tenon. This allows for a clean joint when the pieces are put together. Here Kyle and his assistant are forging the scrolls for the grill, first on the power hammer and then over the horn of the anvil. Detail shot of a pass-through joint in the framing of the grill.